Website design is one best way that demonstrates your business idea visually. It is equally important as the websites backend coding. It is usually seen that website designs are not treated as an important factor. In actual website design is the first thing that appears to the user and makes it attractive to the user. It was time when designs were built with similar old technologies like small HTML and CSS with static pages. In today’s article, we will be discussing the Top 11 Common Web Design Mistakes that needs to be avoided. These are very common mistakes and has much to do with the successful software development design and structural code implementation. These top 11 mistakes mentioned that make a big difference to the overall growth of the niche. In generic terms what actually design means to you? If that is coming with good graphics, your favorite brand clothing, a wall painting or a mosaic artwork. That’s completely relatable. This is what a professional website does with little tricks. Let’s first begin with the basics of the common traits a good design has. Here are the Few Tips for growing your web design Business other than traditional ways of software development. These are the top features a good application possess and make sure that application follows the complete set of conventions and standards. A good design is one thing that has the element of uniqueness in it. It was seen that WordPress remain a significant platform for every professional and the beginner supporting every emerging need. Then most of the website developers didn’t pay much concentration towards the design rather than putting similar designs everywhere without considering the need of business. A good design begins is one that has something different than other brands are missing. It should be customized according to the need of business requirements. Cohesive design means that your specific brand has fluid nature and it’s visible throughout every aspect of the business. In terms of marketing, it should welcome every client by showing your business separately. A cohesive design is one positive approach that develops your business. It makes your niche productive if applied in the right flow from the very beginning. Innovation is one term that is associated with the good design. If you are looking forward to more users on your website than the one thing that can bring traffic to your website is the set of traits that discriminates it from the competitors. Giving similar functionalities as other businesses are giving won’t work anymore. As the completion has gone wider and there are minimum 100 brands that are ready to take your place. In such environment, it is necessary to develop something that others are lacking. Working with floating grids and frames can help you with it. Latest designs are responsive and demand highly responsiveness in the website. WordPress website introduced such platform that supported responsive and good designing. Responsiveness is one basic trait required for developing a good design solution. Today each design you see on the web are mostly responsive and those lacking responsiveness are redeveloping the websites in order to respond to SEO needs. Front end is not all enough but the good design responds to the backend coding as well. It has flexible adaptive nature to support all backend coding as well. It helps in using a reusable code, a proper convention as well. These above mention characteristics will also help in considering Factors to Consider Before Hiring a Web Design Company. 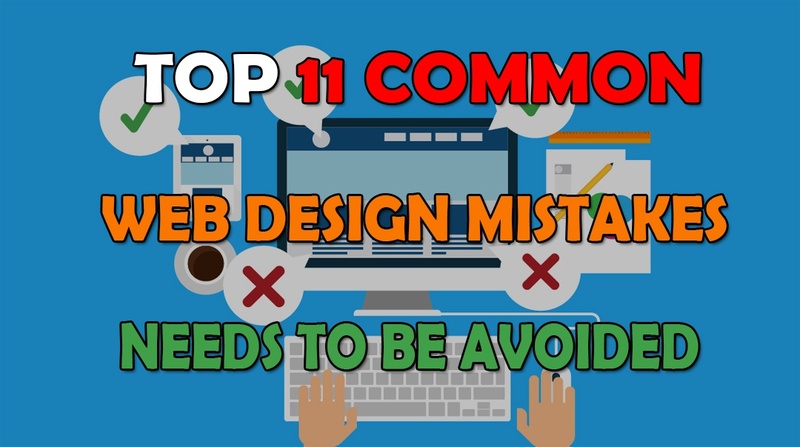 Let’s begin with the most common mistakes that are usually made by the web developers and the web designers usually make. These mistakes not only affect the overall performance of the website but also not well from the perspective of good search engine capabilities. Just imagine entering a website having good background pictures, well written with properly aligned font and elaborated with proper colors scheme. Browsing through that website would feel walking in a place where everything itself is explanatory. It is often seen that websites design are not properly well designed and search bar, content indentation is missing. This happens because most of the time designers and the developers do not put many efforts in terms of SEO elements. The most common bone of contention is because of the H1 tag that is missing on the paper. The H1 tag is one basic and first element that search engine crawlers target to determine what page is all about and what it has inside. It includes main focused keywords that add ups to chances of ranking the page on search engine. The results have shown that large images and the big media files can reduce the website optimization to 70%. Big images have once great impact on the websites in terms of visibility but now Google Page Speed Insights Test can let you know about what Google thinks for images. This is one problem that has much to do with Past, Present, and Future of Web Design and all the current trends of the software development. Recently Google has just warned many websites to avoid using too many intrusive interstitials and other popups. Because this reduces user experience.When a user comes to visit for valuable information and has to experience too much of unwanted popups not only reduces the content readability but also the bad practice in the SEO perspective. Surprisingly, this is one of the major web design issues. Instead of just including too much of text layer on images by the website designers often leads to the problem. Why this is bad practice is because search engines won’t be able to see the images just like a visitor sees on the image. That results in a problem for the text readability as well. Too much of scrolling involved in one page makes it less efficient and ultimately breaks the concentration of the visitor on a website. This is among the most common website mistakes that we usually see in many websites. This not only reduces the overall efficiency of the website but also the core purpose of serving. This is one constraint that requires domain knowledge and the experience. What should be the exact length of the content, depends on which website you are working on and what is the requirement for the niche. Too thin content is not good practice to follow as it won’t be able to convey its message completely. Stuffing too much content is also not a good practice because this can take the interest of user away. Add a balanced content with more graphics to help a reader. Navigations are one efficient way of engaging people in right direction. But mostly it can be seen that web developers and the web designers do not put interest in it and pages are often filled with unnecessary navigations that even redirect to pages that are not directing to correct URL’s. This practice also makes one get annoyed and bad design practice. As every single block of the website is filled with pages and segments. Each individual pages serves some purpose and has a significant impact on a page. It is now seen that the websites have an irregular appearance. They have different sizes for each blog or portion. This practice is bad design practice and so not gives profession look to websites at all. Too much spacing and excessive empty pages often lead to deforming structure of the website and hence decreases the visibility. This is a very common problem that we see today in most of the website. This doesn’t give professional look at all. It is old and worn out technique of placing sounds in the background. Since people are more into automation and easier solutions they prefer an easy platform to handle. In most of the cases, this affects the readability of the text and makes one get annoyed with the noise. This is considered as bad design practice now and people do not prefer to place any music and sounds in the background rather place an option to choose and play audio or video assistance if they want. It is highly non-professional to not write any contact information at the end of the website. It is just like inviting people to your website for your services and do not allow them to make a purchase. This common error is found in most of the websites and does not make potential leads. If you are looking for iOS, Android and Professional Web Development Services than the Coding pixel is one best platform in that regard. It has a team of professionals that work according to the software development convention and delivering the quality product from last 6 years. It has the excellent collaborative environment and has delivered many customized and enterprise level software globally.